I sure am looking forward to Thanksgiving! I’ve already had a couple Thanksgiving Dinners – a couple more to go. Interesting note – the following question has come up twice this week: What’s the difference between a yam and a sweet potato? My guess was that a yam is a yam until it goes to prison and gets a nickname. But that’s just a guess. One of the things I’m most thankful for this Thanksgiving is all the love and support I’ve received from fans and friends. All of the great people that have expressed interest in my work have made it so much fun to do what I do. I have just ONE more small favor to ask of you this year. Campus Activities Magazine is holding their annual Reader’s Choice Awards. Will you vote for me for #10 – NEWEST RISING STAR? I’d be forever grateful! Don’t forget to put your name and info at the bottom or the ballot won’t be counted! 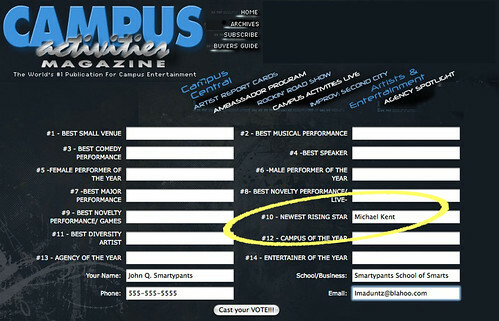 VOTE MICHAEL KENT for NEWEST RISING STAR! ALSO – Vote for my friends – the Showoff Show! for #8 – BEST NOVELTY PERFORMANCE/ LIVE!